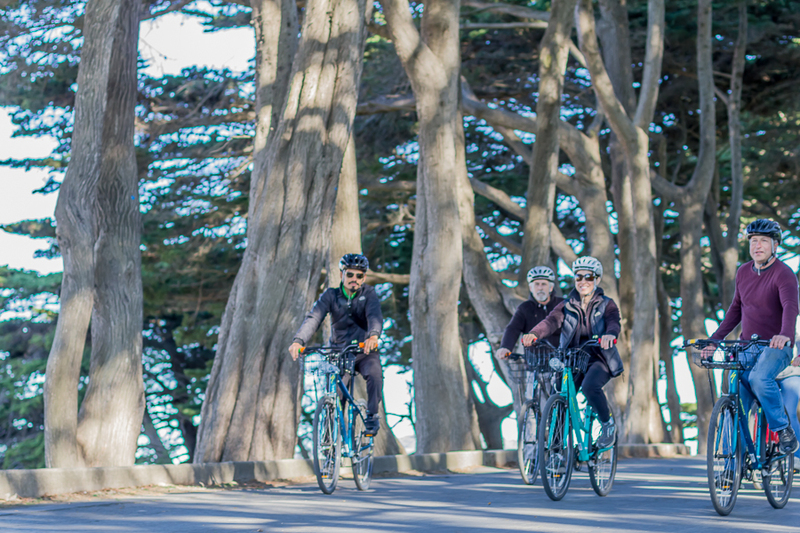 The one-and-only ride along SF's bay waterfront, over the Golden Gate Bridge, and into the picturesque, bayside town of Sausalito. See Alcatraz from land on the tour, and if you prefer, by ferry on the way back from Sausalito. 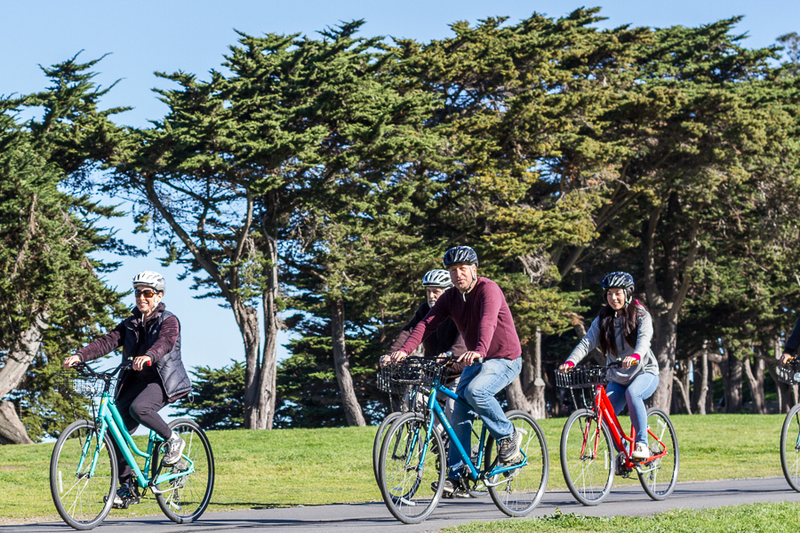 Ride through some of San Francisco’s most beautiful parklands, including Fort Mason. The views of the Golden Gate Bridge get better and better the closer we get to the bridge. Fort Mason, a park on San Franciso’s northern waterfront, sits between bustling Fisherman’s Wharf and the cool, calm Marina district. The Palace of Fine Arts, in San Francisco’s Marina District, was a “temporary” structure built for a 1915 world’s fair. It’s safe to say it isn’t going anywhere. We stop for plenty of photos on our way to and over the Golden Gate Bridge. Built in 1937, the Golden Gate Bridge is proof they just don’t build them like they used to. 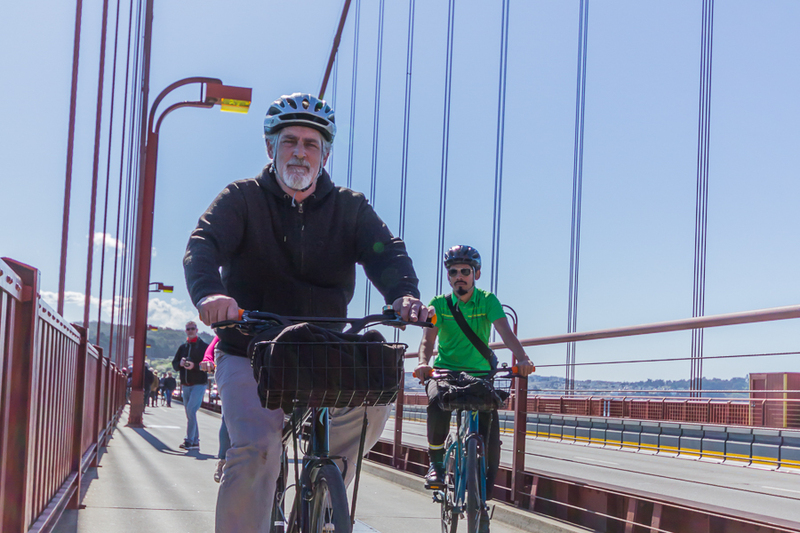 Biking over the Golden Gate Bridge is a bucket-list worthy experience. With the Pacific Ocean to your left, San Francisco Bay to your right, and the Marin Headlands in front of you, there’s plenty to take in. The bridge offers plenty of safe places to stop for epic photo sessions. If you don’t see this tour running on your preferred date, please contact us, and we’ll add it, if possible. 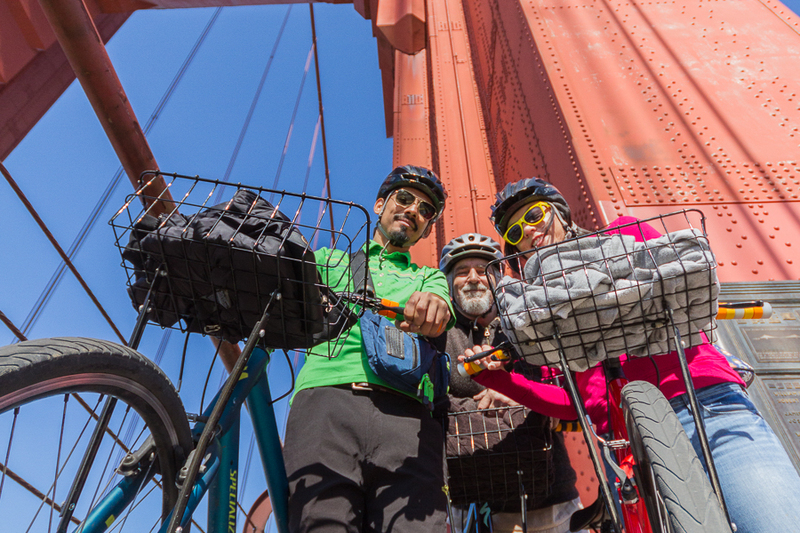 A ride over the Golden Gate Bridge is unlike any other. It really doesn’t get any more picturesque: parklands, beaches, views of the city, and a descent down to the beautiful bayside town of Sausalito all await. 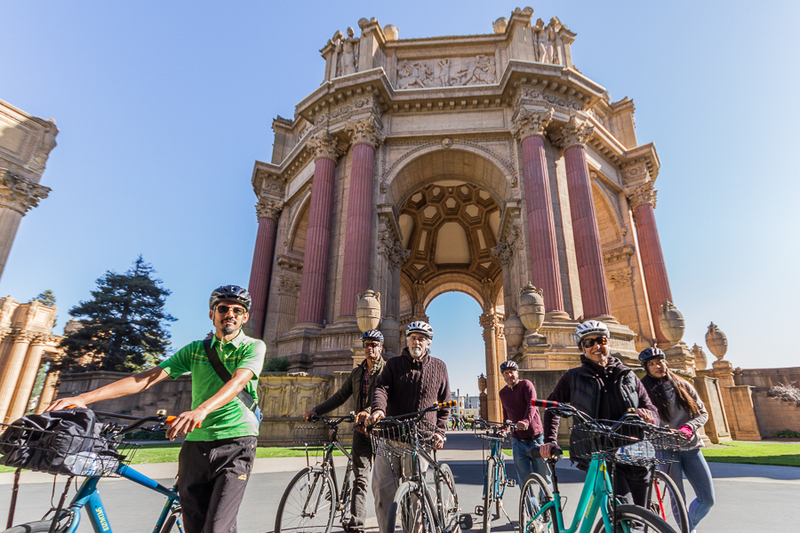 And of course, the main event: the ride over California’s most famous landmark, the Golden Gate Bridge: ocean to your left, San Francisco Bay to your right, and the Marin headlands directly ahead. 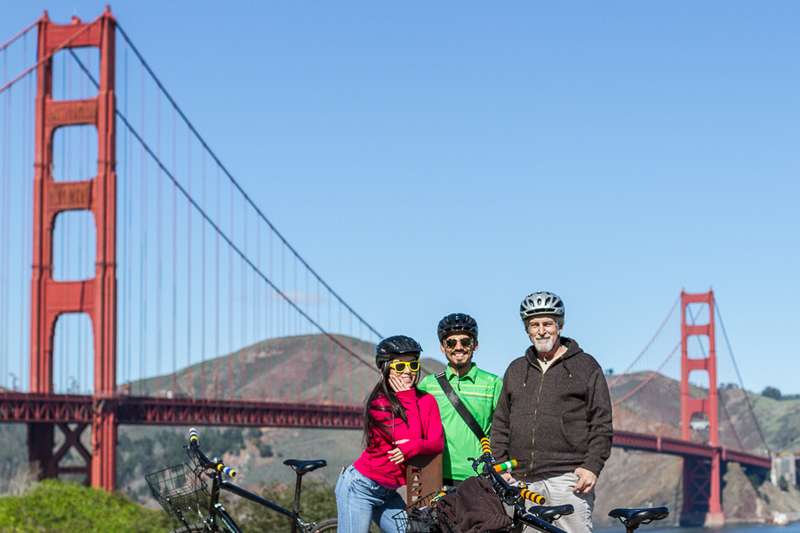 guests are encouraged to have lunch in Sausalito and bring their bikes on the ferry back to San Francisco. The Blue & Gold Fleet ferry disembarks in Fisherman’s Wharf, about 5 minutes from our starting location. You can use the bikes to explore the rest of the day; bikes just need to be back at the shop before closing time. 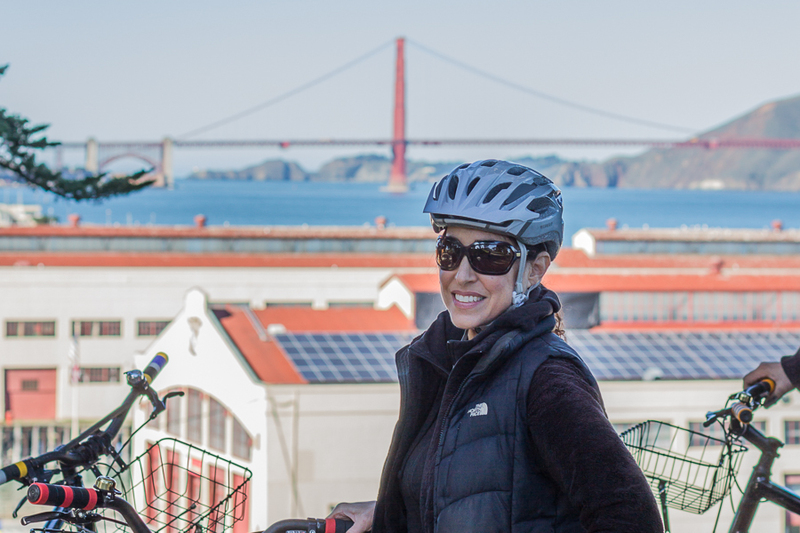 Our Golden Gate tour minimizes the hills and uses the gentlest ascents possible. This tour is designed for anyone comfortable on a bike with a modest level of fitness. There are exactly two hills on this tour: (1) a short hill over Fort Mason and (2) the climb up to the bridge. If any of our tour guests prefer to walk up those hills, we’re all for it. We don’t stop for lunch on this tour, but we do include a snack. If you’re taking the morning tour, consider eating lunch in Sausalito after the tour finishes. 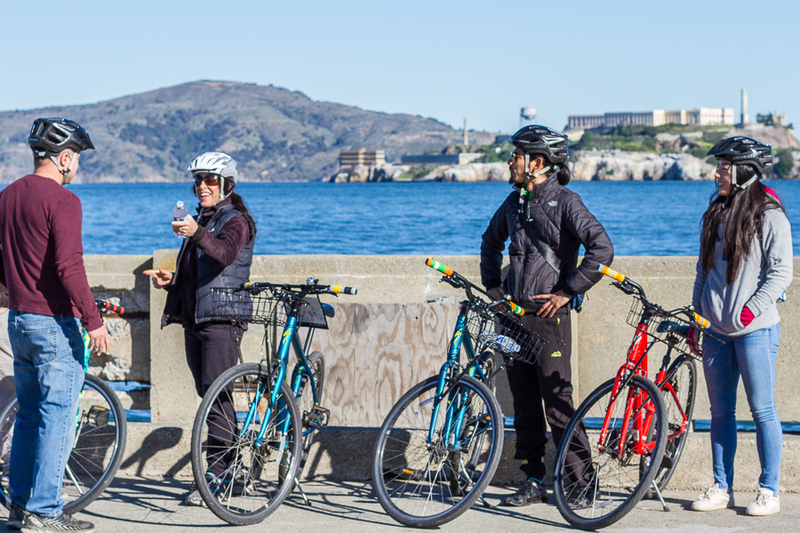 This tour starts in Fisherman’s Wharf at CityRide Bike Rentals at 1325 Columbus Ave. It finishes in the picturesque seaside town of Sausalito, on the other side of the Golden Gate Bridge. 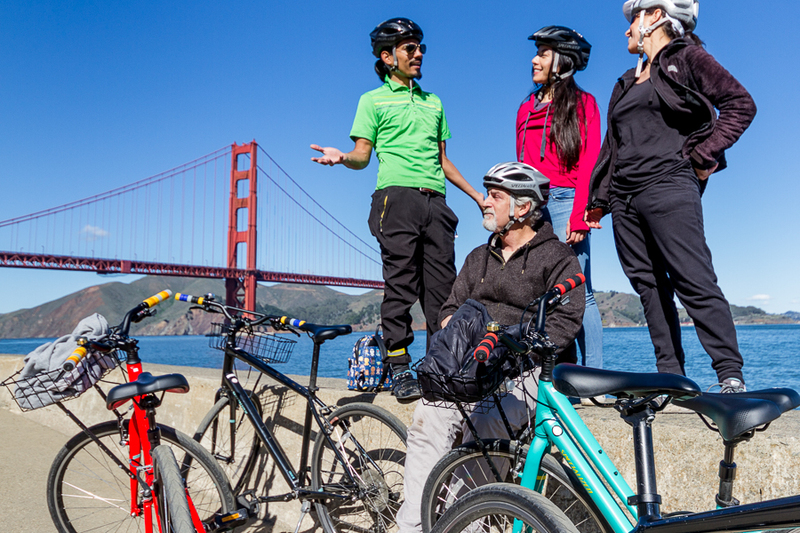 After the tour finishes in Sausalito, you are free to use your bike for the rest of the day on your own. 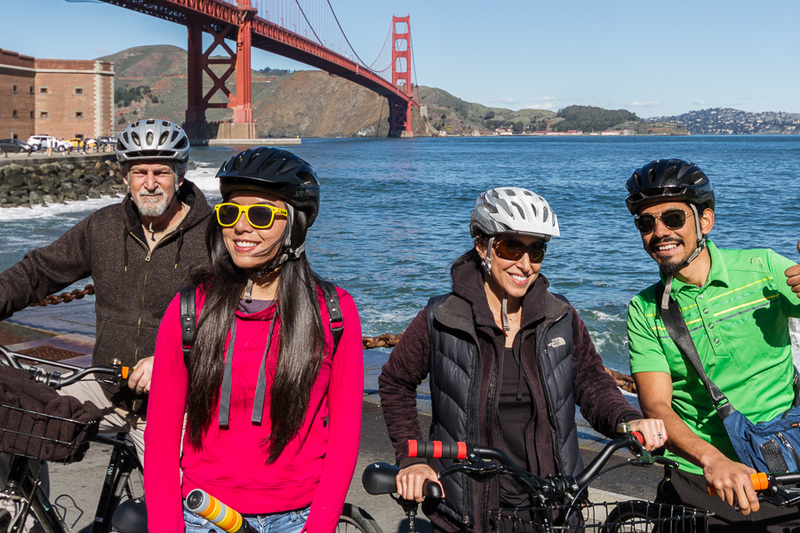 To get back to San Francisco, you can take a ferry (bringing your bike with you) or ride back to San Francisco. Ferry tickets back to San Francisco are additional. Please return your bike to the start location CityRide Bike Rentals. Fisherman’s Wharf: A neighborhood catering to tourists and the most convenient starting location for a ride over the bridge to Sausalito. Fort Mason: Former army post now boasts public space, a busy park, and a youth hostel. The Marina: Ah, the good life: beautiful homes, quiet streets, and views of the bay. Crissy Field: A former military runway, this open space has stunning views of the Golden Gate Bridge and is a favorite play area for dogs and humans alike. The Golden Gate Bridge: Built in 1937 and almost 1.7 miles long, the bridge is and always will be San Francisco’s most famous icon. Sausalito: Small and scenic, Sausalito has splendid views of San Francisco, delicious lunch spots, and beautiful bayside homes. This is our easiest “regular” bike tour, however, you are still riding a bike and going up some minor hills. We ride at a casual pace and make frequent stops.